East Los Angeles College is a community college located in the City of Monterey Park. Enrolling over 30,000 students the college serves the communities of Alhambra, Bell, Bell Gardens, City of Commerce, Cudahy, East Los Angeles, Huntington Park, Los Angeles, Maywood, Montebello, Monterey Park, San Gabriel, South San Gabriel, South Gate, and Vernon. The College is dedicated to supporting students in achieving associate of arts degrees, general education, skill/certificates, and personal development. ELAC ranks second in the nation in terms of Hispanic student transfers to four-year institutions and is the top California degree and certificate producer for the ethnic group. Along with student achievement, ELAC is committed to providing state-of-the-art facilities to serve the needs of the students and its community. From the support and passage of recent bond measures, ELAC is embarking upon a large capital construction campaign, bringing over $400 million dollars of economic development to our community. Completion of a new technology building will take place in fall 2004. Due to the complexity of the building campaign with the campus at full capacity shall present some challenges to the internal community. Building schedules will be guided by these challenges. The next phase of activity will include the addition of parking lots, the renovation of the library, and the remodel of Weingart Stadium. Future construction will include the Health Careers, Language Arts, as well as, a Fine and Performing Arts Complex. The Arts Complex will accommodate a new structure for the Vincent Price Gallery and Museum, which currently houses one of the largest and most prominent art collections for any community college in the world. You can visit the East Los Angeles College website at www.elac.edu. East Los Angeles College was established in June 1945 by the Los Angeles City Board of Education. The College opened for classes in September 1945, on the campus of Garfield High School with an enrollment of 380 students and a faculty of nineteen. The College was moved to its present 82 acre site on Avenida Cesar Chavez in February 1948. The College is located in the San Gabriel Valley, six miles from the Los Angeles Civic Center. 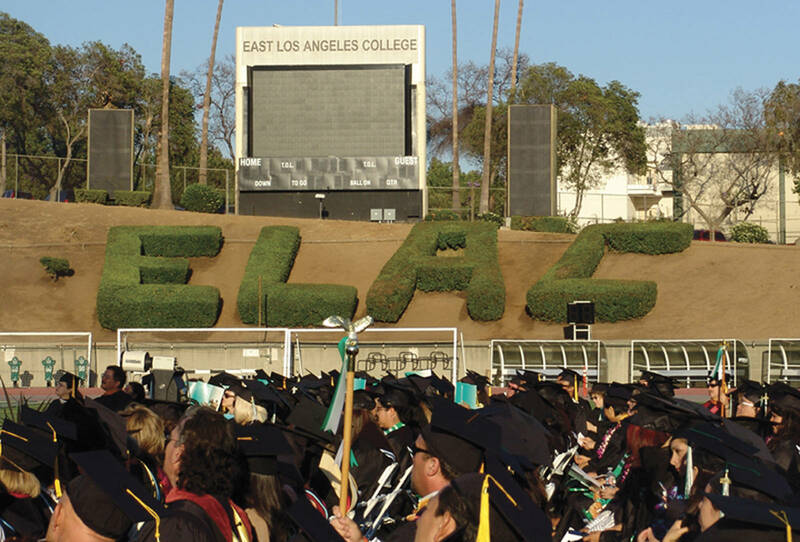 Today, East Los Angeles is one of the nine public two-year colleges within the Los Angeles Community College District. It is the largest college (by enrollment) in the largest community college district in the world. Increasing student success and academic excellence through student-centered instruction, student-centered support services, and dynamic technologies. Increasing equity in successful outcomes by analyzing gaps in student achievement and using this to identify and implement effective models and programming to remedy these gaps. Sustaining community-centered access, participation, and preparation that improves the college's presence in the community, maximizes access to higher education and provides outlets for artistic, civic, cultural, scientific and social expression as well as environmental awareness. Ensuring institutional effectiveness and accountability through data-driven decision-making as well as evaluation and improvement of all college programs and governance structures. In collaboration with the District’s Mission, ELAC is committed to advancement in student learning and student achievement that prepares students to transfer, successfully complete workforce development programs, earn associate degrees, and pursue opportunities for lifelong learning and civic engagement. Through our emerging focus on student-centered instruction, student-centered services, and integrated learning, East Los Angeles College will be an exemplary model for student academic achievement, skill development, and artistic expression.